Cisco’s Mobile Experience Business Offer unleashes the power of your network to better serve your customers with locations based analytics, real time interactions, and mobile experience development tools. You can get basic location services that can be deployed in minutes, and later add more sophisticated location features over time with investment protection. 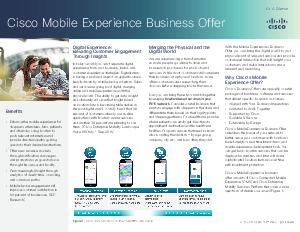 Cisco’s Mobile Experience business offer consists of Cisco Connected Mobile Experience (CMX) and Cisco Enterprise Mobility Services Platform that cover a wide spectrum of mobile use cases. It’s based on Cisco Wireless Infrastructure (Cisco Aironet or Cisco Meraki), and can integrate with your customer relationship management (CRM) and customer information file (CIF) applications using a flexible mobile API. It enables locations awareness (including optional hyperlocation), offer push, notification, navigation, and guest Wi-Fi.